If you are like many Americans in your generation, you would prefer to live independently in your own residence rather than in an assisted care facility. A growing number of older adults are choosing to age in place, and many adult children are moving aging parents into their home. If you’re considering in-home care as an option, you may need to make some modifications to you or your loved one’s home to make it as safe as possible. The AARP reports 1 in 4 adults over age 65 take a fall annually, but you can lessen the chances of a fall with some simple adaptations. Many of them can be done in a single day. If you’re an older adult living independently or you are caring for an aging loved one, here are some safety tips to make the home as safe as possible. The living room is a great place for the elderly to entertain family and friends. It’s also a great place for them to finally enjoy the rest and relaxation they’ve been working towards their whole lives. But, it can also be a place full of little hazards for an older adult. 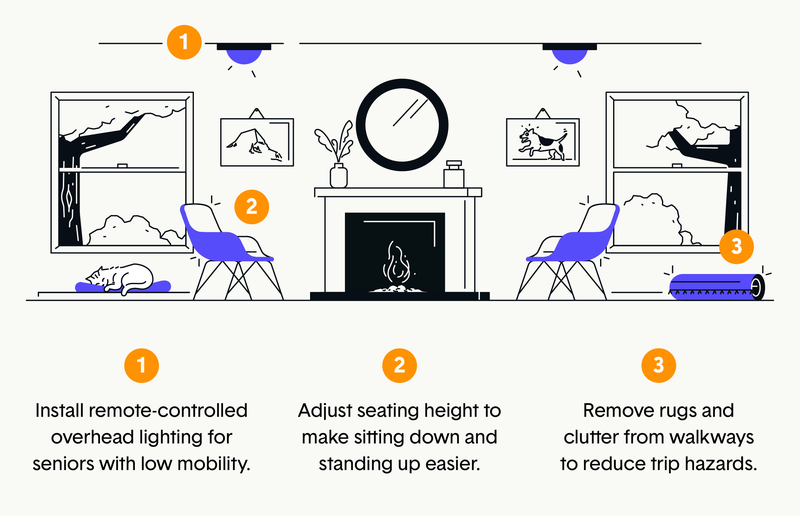 Read through our tips below to see how you can help make sure your loved one’s living room is properly equipped for them to enjoy in their golden years. Seating should be the appropriate height for older adults. That means that their feet should be able to touch the floor when sitting on the edge and that their hips don’t start too far below their knees, as this can make getting up difficult. Adjust the legs of the chairs and couches to get the proper height or add cushions to help elevate the seat surfaces. All couches and chairs should be stable and not sway or wobble. Make sure that seating is not too low, too soft, or too deep. If you have to rock back and forth to gain momentum to get into a standing position, the chair or couch doesn’t offer enough support. This can present a hazard in terms of hip fractures. Use seating with high arms for assistance in pulling yourself to a standing position. Lightweight furniture is easier to maneuver, which is especially important for dining or activity chairs that need to be moved away from a table in order to sit down. The front of the arm should be flat and able to be grasped easily when sitting or standing. An older person needs to be able to steady themselves as they stand in order to prevent a fall. As we age, weakening eye muscles and a decreased pupil size mean we need more light to see as well as we did before. Lighting in the living room should be bright without being harsh. This will keep visibility high while you or your loved one goes about their daily activities. Install lighting with remotes for older adults who have mobility issuesso they don’t have to reach light switches. If visibility is low in the living room, add track lighting where necessary. This can help increase the illumination in the room to the levels needed for persons over age 65. Different areas of the home require different types of lighting. Hallways, closets, and stairwells should have bright lights. Inadequate lighting in these areas could be associated with a fall. Extra lamps, especially models that turn on and off with a touch, make it more convenient to make the room brighter as evening falls. They increase ambient light levels or better visibility throughout the room and are easily portable. Light quality is as important as increased light levels. Good lighting should decrease shadows, reflections, and glare. Older adults are more sensitive to glare, so while lighting should be plentiful it should also be shielded. Repaint walls a lighter color. A matte finish will reduce glare, and paint with a higher Light Reflective Value will increase ambient light levels in the room. Your eyesight may require two to six times more light than it did when you were younger. Windows should be well insulated to keep heat out in the summer and keep heat in the winter. Extreme temperatures can make anyone sick, but older adults lose body heat faster than when we are young. Being in a very cold house can lead to hypothermia, and a chill can become dangerous before you are even aware of what is happening. Check that all window seals are tight and not letting any air escape. This ensures you aren’t losing heat through the windows, which could put you at risk for hypothermia. Use heat-control window film or install double-pane windows that are better insulated. 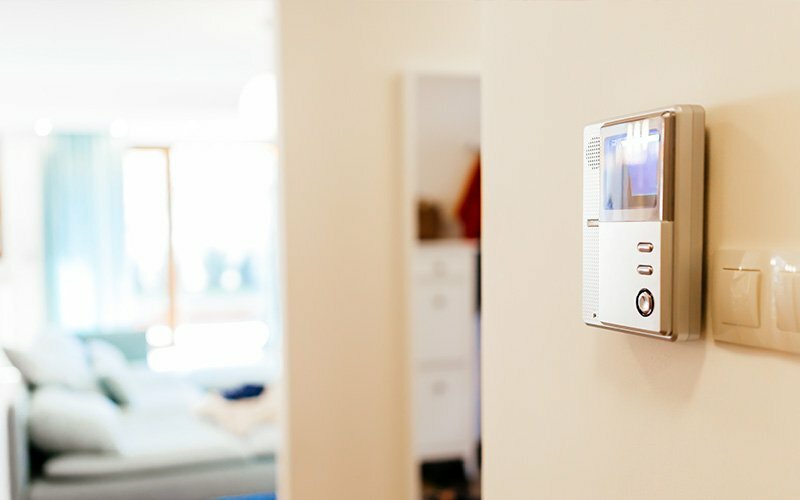 This can prevent the house from becoming too cold, and your body temperature from falling below 95 degrees, the point where health problems may occur. Add curtains and shades to any large windows to help control lighting and temperature in the living room. For safety, keep your windows locked at all times. This can help protect older people from abuse. Set your heat to at least 68 to 70 degrees. 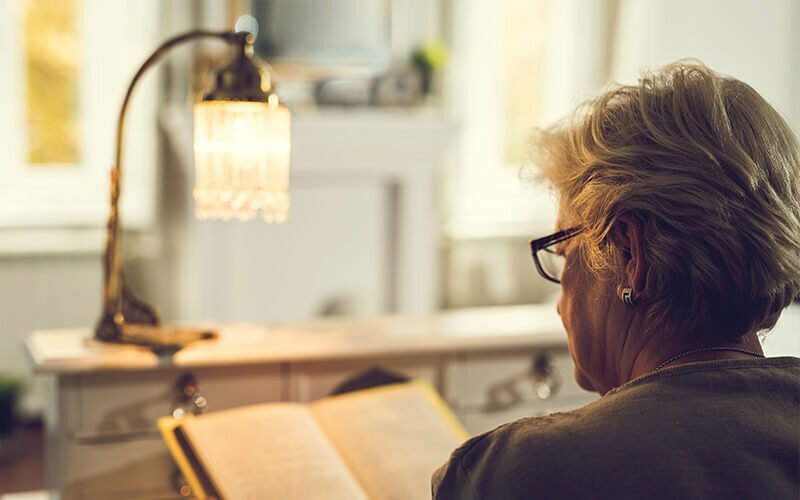 Older people may be tempted to save on electric bills by turning down the heat, especially as inflation means retirement savings need to stretch further. To save on heating bills, placed a rolled towel in front of doors to keep out drafts and close off rooms you aren’t using. Avoid space heaters, which are fire hazards and can cause carbon monoxide poisoning. This is true for adults of any age, but carbon monoxide is a deadly gas you cannot see or smell, so it is especially important if you live alone. There are many great non-slip flooring options that are easily installed that can reduce the risk of a fall if your older adult has slick wood or tile flooring. If an older person falls, they have a decreased chance of a fast recovery. It’s important for an older adult to have flooring that is safe to walk on, and easy to maintain. Keep all walkways free of obstruction and remove any clutter around the living room that could be a trip hazard. Remove rugs that slip easily or curl up at the edges as this is also a major trip and fall hazard. Add a hail railing for greater stability while walking. Use carpet staples to secure the carpet, non-slip rug liners and double-sided rug tape to keep rugs in place. Carpet that is torn and lifted up in areas can cause a tripping hazard. Likewise, rugs that slide easily or curl up at the corners are also a major tripping hazard. Replace rugs and carpet with soft wood or wood-like flooring. This can make getting around easier and safer. Always wear proper fitting shoes with low heels. Apply non-slip wax to hard floors. Linoleum floors offer some cushioning in case of a fall and are anti-microbial, which could benefit older adults with weak immune systems. Non-slip vinyl floors don’t require wax and provide added stability for those wearing rubber-soled shoes. Avoid tile and natural stone. A surface as hard as tile or stone could lead to a broken pelvis or hip, which could be life-threatening. A bedroom is a place of rest, peace and quiet, security and safety. 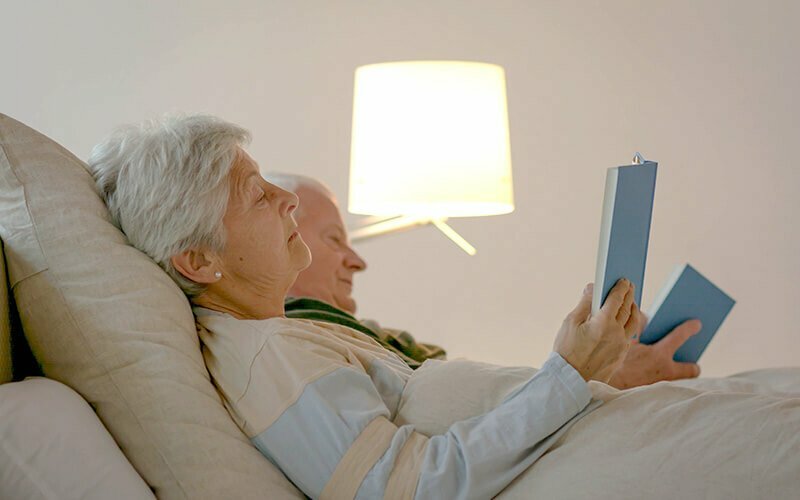 But, given that it is often dark and used when an elderly person is tired and not in the sharpest mindset, it’s imperative that the bedroom is designed for comfort and ease-of-use. 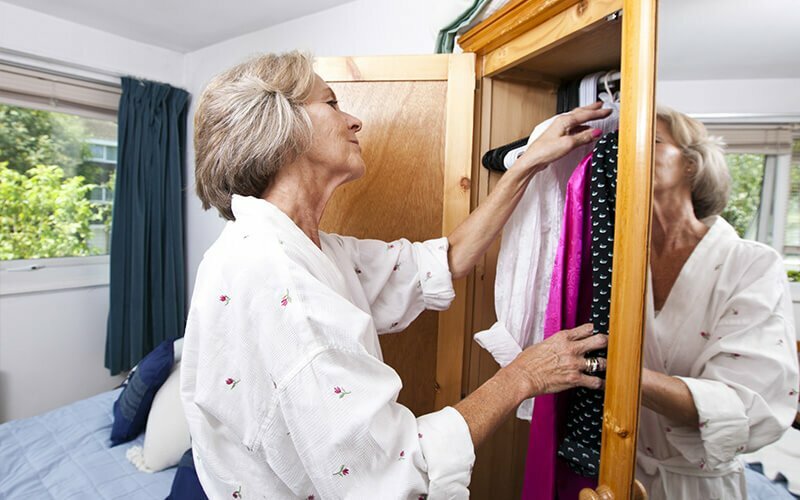 Here is a list of items and actions to help you ensure your elderly loved one’s bedroom is safe. Items stacked high in closets, bulky furniture taking up too much space, and clothing cluttering the bedroom are all causes for concern. After many years of life, it’s natural to have accumulated belongings. Sentimental items and piles of paperwork, such as tax returns and newspaper clippings, can make it hard to find the things we use every day. Clearing out large items makes for better walkways and easier access to necessary things like clothing. The first step to resolving a clutter issue is to simply get rid of things. Don’t try to tackle too much at one time. Three hours is a good time limit to give yourself. This allows you to refocus and feel positive when you return to the task. Prepare three boxes labeled 1) keep, 2) toss, or 3) sell/donate. This makes the task of sorting easier, and allows you to stop at any point you begin to feel tired. When you finish for the day, put away your keep items and put your toss items into the garbage. Be realistic about your storage space. If you’ve downsized in your later years, the possessions that moved from your previous home may need to be downsized as well. If the items have sentimental value, think about getting a storage unit to store them in. Items we love may define us as individuals or remind us of the loved ones we have lost. You should decide which items are most important and keep the items that you love. Use small, lightweight storage containers and install shelving to help you or your loved one get organized. Consult your attorney or accountant to see which financial papers you should keep, and which you can toss. In this age of digital files, keeping 30 years of paperwork isn’t necessary. Lighting in the bedroom is important for any time of day. Lighting throughout the house, but especially in the bedroom, should be easily accessible. Lighting with remotes ensure you or your elderly loved one doesn’t have to get up and search for the switch in the dark. Nightlights and low wattage string lighting can stay on at all times for those late night trips to the kitchen or bathroom. Run string lighting along baseboards to light the floor to and from the bathroom or kitchen. These are paths we all frequent regularly, and often at night. String lighting will improve visibility for nighttime trips to the bathroom or to get a glass of water. Check batteries and bulbs regularly to make sure everything is still working. Check the wattage of your light fixtures before increasing the wattage. You never want to exceed the maximum wattage of a lamp or light fixture. If you need to increase ambient light for better visibility, add track lighting or another lamp. 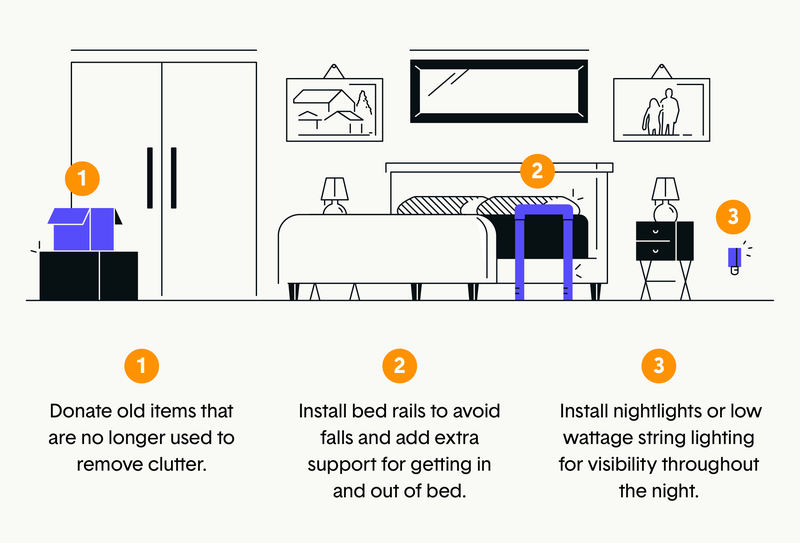 Getting in and out of bed gets tougher as we age, but there are simple fixes in bed height that can make this process much easier. When sitting on the edge of the bed, your knees should be parallel or below your hips. Likewise, your feet should always be able to touch the floor when sitting on the edge of the bed. Many bed frames allow for height adjustments, preventing difficulty getting out of bed. A frame that is the wrong height could cause you to use rocking momentum to rise, which can increase the risk of a hip fracture and/or fall. Change the size of the box spring or mattress to get the best height. Bed rails prevent falls in the middle of the night and offer extra support when getting in and out of bed. Consider purchasing an adjustable bed rail with LED nightlights to make it easier for an older adult to get in and out of bed when it’s still dark and visibility is low. Make sure that the bed rail can be operated correctly by whoever is using them, especially if the person is going to be at home alone. Check the weight limit on the bed rail to make sure that it is appropriate for you or your loved one to use. The bathroom is full of hard, slippery surfaces which makes it a common place for falls and injuries at any age, but especially for the elderly. Read through our tips below to see how you can secure a bathroom and prevent any mishaps for your elderly loved one. 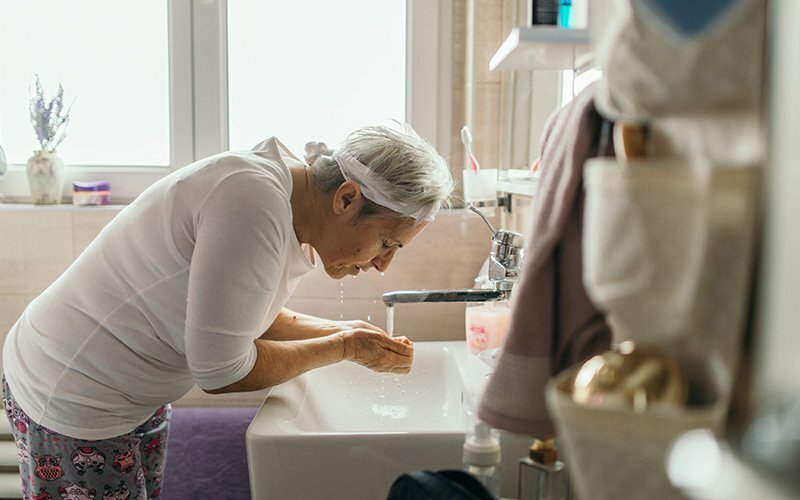 The shower might be the most dangerous place in the house for an older adult since it’s so easy to slip and fall, and a fall can be so dangerous given a shower’s hard surface. It may also be hard to be heard over the shower or to reach a phone to call for help. You may want to remove locks on bathroom doors so that if someone does need to assist, they are able to get inside without delay. A rubber mat or non-stick decals should be among the first things installed in an older adult’s bathroom. They are cheap and easy to put in and make a huge difference in the traction at the bottom of a tub, preventing a fall. A handheld showerhead on a sliding rail allows for individual adjustment, making it easier to shower while seated. You’ll want to pair this with an ADA-compliant grab bar for safety, as a handheld showerhead is too flimsy to grab onto during a fall. The thermostat for the shower water should be set no higher than 120 degrees Fahrenheit to prevent scalding. Age-related sensory loss, thinner skin, and decreased mobility could lead to burns if the water temperature is set too high. Sink, tub, and shower anti-scalding devices recognize when the water is too hot and stop the flow. If an individual has compromised health or is undergoing chemotherapy, the increased bacterial growth from a lower water temperature may not be suitable. In these cases, an anti-scalding device can protect against burns. They are relatively inexpensive and easy to install. They are best used when a caregiver is present, since the water may need to be manually remixed to the proper temperature. Hot and cold shower levers should be easily identifiable for the older adult using them, especially since visibility may be lower in the shower without visual aids such as glasses. If the towel racks in your elderly loved one’s bathroom are loose, that is a clear sign they’re using them for support. Towel racks are not designed to act as grab bars and can easily be pulled out of a wall, causing a fall. Instead, install grab bars in and around the shower, near the toilet and anywhere else they may need support. There are a few seating options to consider for the bathrooms of an elderly loved one. Each option helps older adults who struggle with getting up and down from different heights. 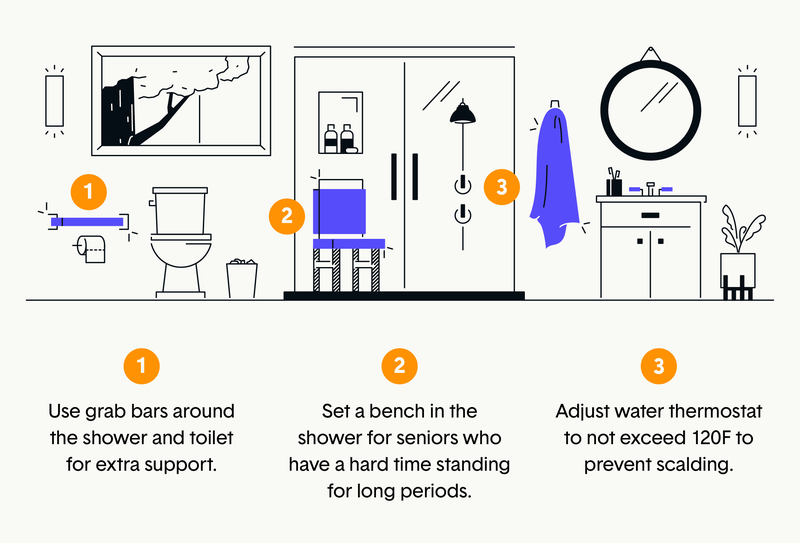 Adding a seat to the shower helps older adults who have a hard time standing for long periods of time. It also gives them a stable place to rest while showering. A vertical bar should be installed at the tub edge. If you are having a hard time getting in and out of your tub, a grab bar can make it easier. An angled bar should be installed on the long back wall of the tub.These bars give you something sturdy to grasp in case of a fall. The best location for the bars depends on who will be using them, so discuss placement with your loved one before installing them. Grab bars don’t have to make your home look institutional. “Designer grab bars” are both sturdy and stylish. Some even serve double duty as towel racks and toilet paper holders. Shower transfer benches allow you to sit and slide into and out of the shower easily. This can help if you are having a harder time getting in and out of the shower due to decreased flexibility. Raised toilet seats decrease the distance an older adult has to sit when using the toilet. Most raised toilet seats will fit directly onto the bowl, making installation easy. Keeping an older adult’s medication organized and easily within reach is incredibly important. Install a medicine cabinet that can be reached easily and consider keeping medications in a daily pill organizer. If the bathroom becomes cramped with medications, it may be best to move medications to the kitchen where it’s easy to remember to take them with meals. Make and maintain a medicine list that includes all the medications you or your loved one takes (including OTCs or herbal supplements), the name of the healthcare provider who prescribed them, and how often and at what dosage you should take them. Check expiration dates, and discard expired medications safely. Keep all medications in the bottle or box they came in so instructions are close at hand. Store medications safely out of reach of pets and visiting grandchildren. The kitchen is a central place in any home and a room in which family members spend plenty of time. Be sure it’s well-equipped for your elderly loved one with the below tips. A kitchen should be rearranged as needed to make daily use items accessible so that you have easy access to cookware and canned goods. This puts less strain on your back and knees. Having everything is at hand and conveniently located makes it easier to make healthy meals without extra work. It also prevents you from buying things you already own. Be aware of any items that are too high or too heavy for an older adult to reach. Move pots, pans and any other kitchenware to the lowest shelves possible. Pull-down shelves are great for storing items in hard to reach areas. Consider storing heavy items like mixers, cast iron skillets, dutch ovens, and food processors on the counter and not below waist level, as lifting heavy items from low surfaces can cause injury. Spice racks and lazy susans are great space-saving options for decluttering spice and condiment cabinets. Store cleaning products and hazardous items separately from food. It’s common for an older adult’s appetite to dwindle. 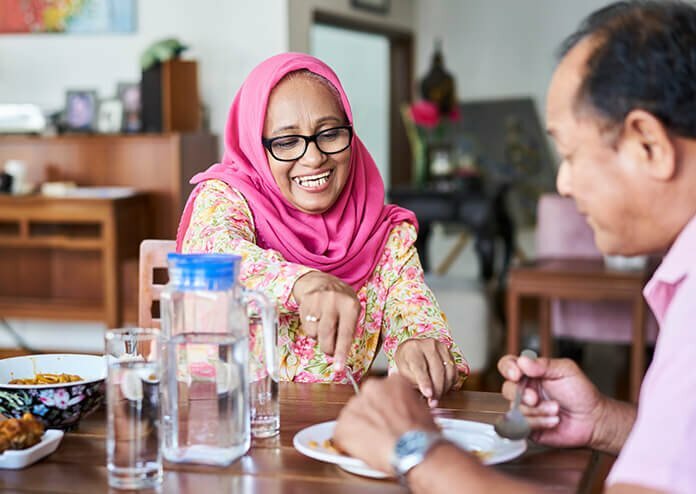 If the older adult in your life is experiencing a loss of appetite, exercise and staying hydrated can help boost hunger. While boosting their appetite should be the ultimate goal, a loss of appetite can lead to old food accumulating in pantries and the fridge. Ingesting expired food can make anyone sick, but adults over 65 are even more susceptible to food poisoning. Double-check expiration dates on all canned and fresh food items. Instead of relying on a sight or smell test before eating, always use a food thermometer to check the doneness of meat, poultry and egg dishes. Label leftovers with a date and throw away items that are more than a day or two old. Don’t rely on your memory. If you need glasses, be sure to wear them when handling food. Making simple dishes allows you to save your energy for cleanup. Rather than spending time on extensive prep work such as chopping vegetables, buy pre-chopped frozen vegetables. Refrigerate leftovers immediately and use a food thermometer when reheating, to ensure they’ve reached the proper temperature. Everyone should follow this rule, but chronic conditions such as arthritis or cardiovascular disease may weaken the immune system. Set up a support system of friends and family to help with meals and cleanup. This can help keep your nutritional needs met and your kitchen sanitary when your energy is low. As we grow older, decreased mobility and hearing loss can make it hard to respond quickly to an emergency. 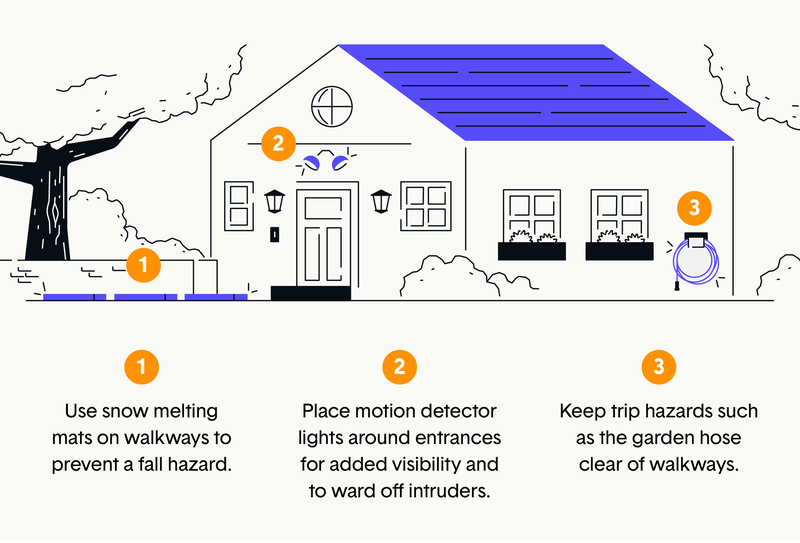 Fires are a serious risk for older adults, but they can mostly be prevented by taking a few extra steps. 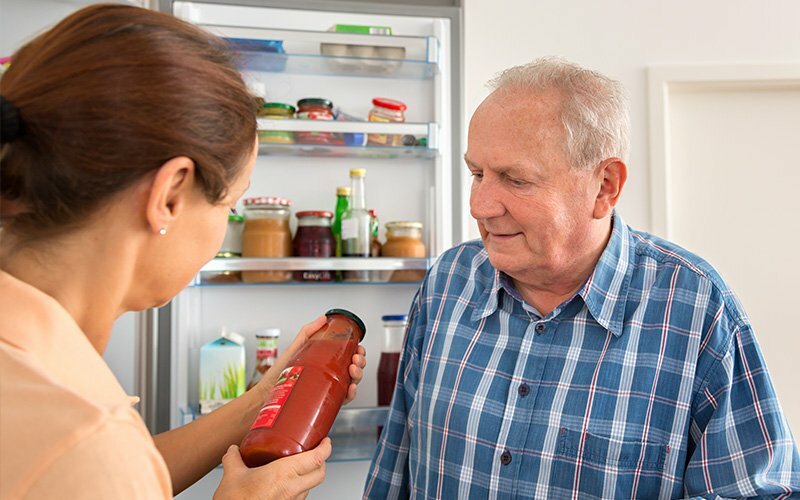 A list of emergency contact numbers should be placed on the front of the fridge, along with any other important contact information an older adult may need. If your loved one has a smartphone, label any emergency contacts with the abbreviation ICE (in case of emergency). If someone finds your loved one they can check who best to contact first. This is a good tip for anyone at any age. A working fire extinguisher should be placed in an easy-to-reach spot in case of emergency. If you have multiple floors, you should keep a fire extinguisher on every floor. 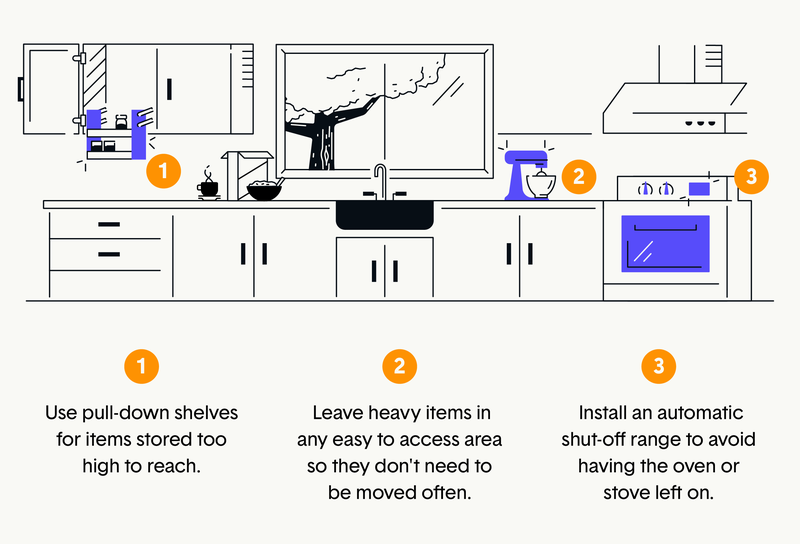 Move flammable items like curtains and paper towels as far away from the range/stove as possible. An automatic shut-off range means you never have to worry about your loved one leaving the oven or stovetop on again. Install smoke and carbon monoxide alarms, and test them regularly. Kick the smoking habit, or help your loved one to cut out cigarettes. Smoking is the top cause of fires for older adults. 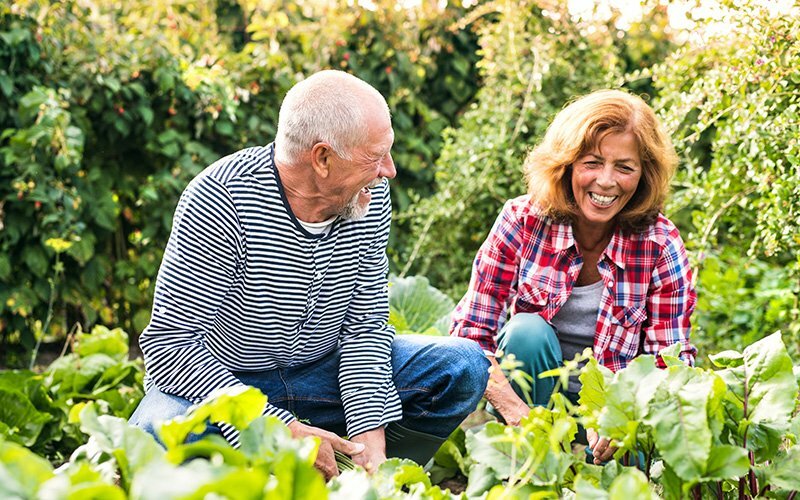 Spending time working in the garden and enjoying the outdoors is a great way for older adults to stay active. But, it’s no secret that yards and gardens require lots of upkeep and can pose a risk of falls and other injuries. Take a look at our tips below to help keep your older adult’s outdoor space safe. Older adults should get help removing snow and ice from their sidewalks and driveways. The best option would be to hire a year-round yard maintenance crew that will mow the yard in the warmer months and shovel snow in the colder months. Install snow melting mats along walkways to help keep the snow down if hiring a maintenance team is not an option. Be on the lookout for slip-and-fall hazards such as leaves, fallen branches, the garden hose and especially ice. Make sure walkways are clear of bikes, lawn ornaments and grandchildren’s outdoor toys. If your loved one still wishes to maintain their own yard, encourage them to always do yard work with a friend and make sure they work within their limits. You should always stay hydrated and stay away from caffeine and nicotine while doing yard work, as these can stress an older person’s heart when working hard. Be realistic about what you are able to do, and seek assistance for the remainder. Take a few minutes to stretch and warm up your muscles before engaging your muscles. Try to switch up tasks every half-hour so you avoid repetitive-use injury. As for any adult, you should always lift properly. Bend at the knees and not the back. Use a wheelbarrow or cart to transport anything heavy so that you avoid straining your back. Wear gloves and protect your body with lightweight long-sleeve shirts and pants. Physical (zinc- or titanium-based) sunscreen and a wide-brimmed hat may help prevent melanoma and skin damage on thinner skin. For loved ones with Alzheimer’s disease or other conditions that make them prone to wandering, there are a few tips you can implement to help reduce their chances of getting lost. A GPS tracker can be a lifesaver, and those designed for older adults have functions that include emergency buttons and health metrics. They can give you peace of mind, knowing that you can locate a loved one should they become lost. The most effective thing you can do is install a fence in the front and back yard. Add obvious indicators around entrances like large flower pots and easily recognizable yard art to help remind them of where they are and where they need to go. Modern GPS trackers are discrete, able to be worn as a necklace or watch or carried in the bottom of a bag. Motion detector lights and solar lighting to illuminate walkways and entrances at night are a great option for anybody, but especially seniors. Motion detector lights can also serve as a deterrent to intruders who may try to steal from or harm your older loved one. Any home is improved by a good doorbell. There are a few doorbell options that can be helpful for older adults. Doorbell technology with louder sounds and more convenience mean the difference between missing or receiving an important visitor or package. Install a particularly loud chiming doorbell to help alert an older adult with decreased hearing that someone is at their door. Most doorbells have volume adjustments, so you may just need to adjust the one already in place to a louder setting. Install a doorbell that flashes a strobe light inside. A flashing light that goes off when the doorbell rings can alert older adults hard of hearing that someone is at the door. A doorbell with an intercom system lets you know who is ringing before you answer. Smart video doorbells allow you to view and speak to your visitors without getting up and view a video clip when motion is detected. With some small measures, you can adapt your or your loved one’s home to make it safer and easier to navigate. By making simple modifications such as adding grab rails, more light, and eliminating clutter, you or your loved one can live comfortably in the home for years to come. Once you’ve created a safe space at home, you’ll also want to consider vehicle safety, whether you are driving your loved one on errands or they are still driving themselves. The best vehicles for older drivers are the ones that have above average visibility, a high number of safety features, and easy-to-use control panels. You’ll also want to make sure you have excellent coverage in car insurance, as should drivers of all ages.